Unique technical monument, the last one in the world to measure Babylonian and old Bohemian time. It shows the movements of the heavenly bodies and speaks to the symbolism of the Middle Ages. Every hour the clock revive fascinating theater marching apostles, moving statues along its edges that ended their powerful sound of the bell at the top of the tower. Several times in history "had a narrow escape", but he was someone who could revive the complicated mechanism. 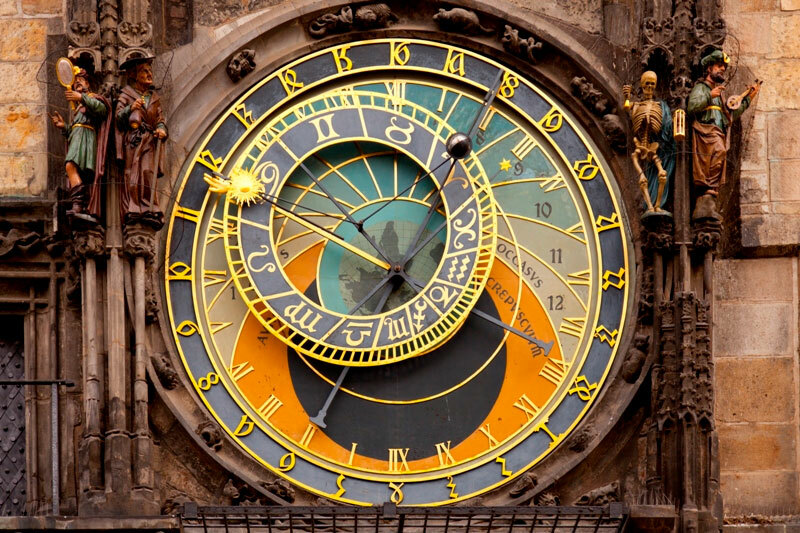 The Astronomical Clock is a part of the southern wall of the Old Town Hall in Prague. He made it in 1410 by Mikulas of Kadan. Known legend of the Master Hanus, who constructed an astronomical clock, and then his eyes were singled out, so no one could create a similar work is not based on truth. The fact is that in the late 15th century Master Hanus clock repaired - said it back in operation. The fact that the fathers had him blind as a reward, is not known. The astronomical clock was stopped again in 1865 and then did no one could be put into operation. It was decided that ends up in the scrap heap. Everything went well when he still found a watchmaker who was able to revive the complicated mechanism. Clockmaker Louis Hainz then became the administrator of the clock and after him and his descendants. In recent days II. World War II, when the Germans bombarded the city from Letna, Old Town Hall burnt down in the fire, the clock was badly damaged. After the war the councilor turned to renowned watchmaker Hainz firm opinion on what the clock. This proposed mechanism blow heavily damaged and equip clock modern machine. One employee of the company regardless of the opinion of management, on his own clock dismantled, repaired and restored. By this unique monument saved for future generations. 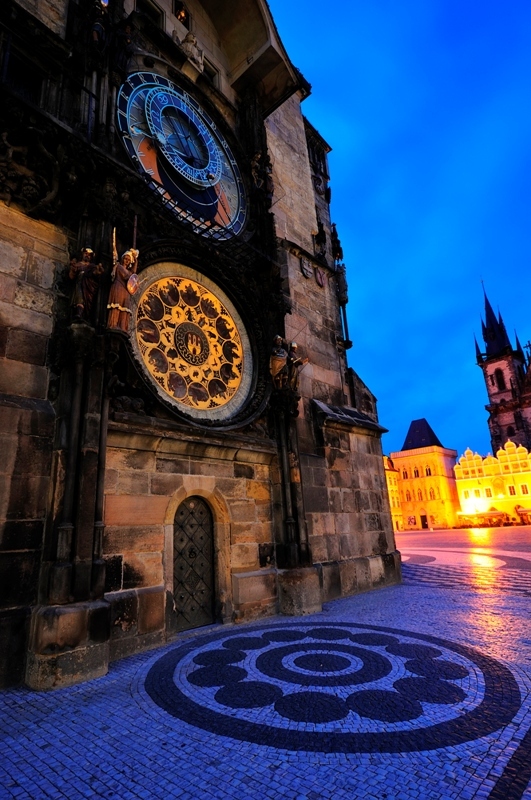 The Astronomical Clock has three parts: the maximum mechanical figures. Every hour from 9.00 to 21.00 hrs. In two windows under the roof of 12 apostles appear, each of which has its attribute. In the left window from outside view with the viewer first appears sv. Petr key, Vol. Matthew ax, Vol. Jan chalice, Vol. Andrew with a cross-shaped X, Vol. Filip Cross, Vol. James with a washboard, and in the right window St. Paul with a book, Vol. Thomas with a spear, Vol. Simon with a saw, Vol. Thaddeus with boards, Vol. Bartholomew with leather, Vol. Barnabas with a scroll. With the movement of the Apostles they are also revived and figures on the sides of the clock. The skeleton pulls the rope and starts ringing march apostles in two windows. Nods in Turk - allegory of pleasure that twisting of the head refuses Miser nodding his head with a purse in his hands and threatens to stick. Vain side is looking down in the mirror. Rooster in the opening after closing the windows crows - waking up to another hour of life, and the clock tower begin to chime. The rumors on his first morning crow of fleeing ghosts and devils. At the level of calendar plates are seated motionless wooden sculptures called the philosopher with a quill, astronomer with telescope, Chronicler (with book and Archangel Michael with a flaming sword. The clock is divided on the calendar with zodiac and hours. Calendar plates with allegories of months, created in 1865 by Josef Manes. dial shows the day and its position in the week, month and year. The clock shows four types of time: Central European Time (solar pointer) is marked with Roman numerals on the periphery of the sphere. This time the clock strikes only from reconstruction in. 1948. Before that followed the old Bohemian time when sunset began a new day (gold Gothic numbers separately controlled ring outside of the sphere). Babylonian time is also called planetní time, according to the Babylonians every hour ruled by one planet. It lasts from sunrise to sunset, so in the summer hours longer than in winter. Time All-Star is measured at Roman numerals. 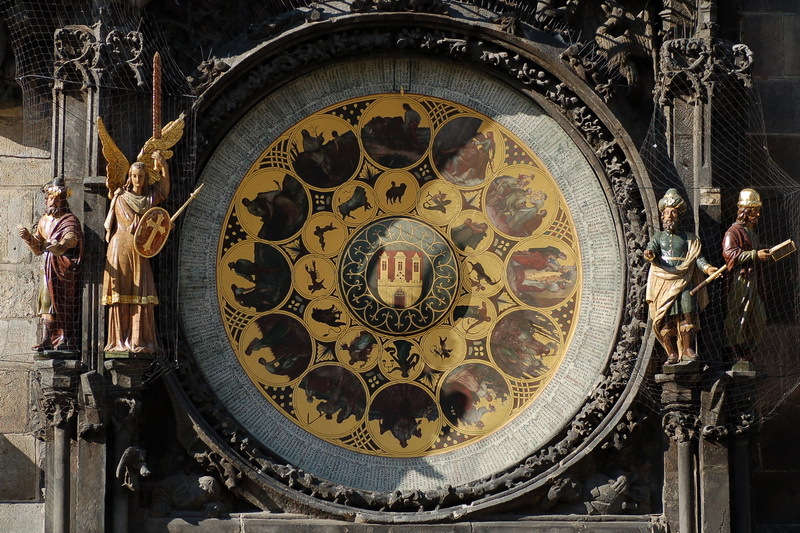 The astronomical part of the clock shows the positions of celestial bodies. The clock mechanism is hidden in the walls of City Hall, in the stone turret, to which are two keys: one has orlojník, the second is at the City Hall. By the end of the war with the clock reaching the handle, then was connected to the electric motor.